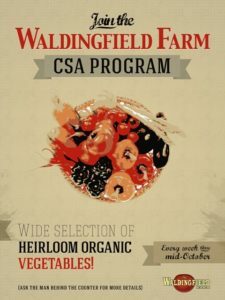 Thanks for enquiring about a CSA with Waldingfield Farm! We are happy to announce that our 2019 season signup is now open. Payment can be made online (https://waldingfieldfarm.com/csa/), or with checks and/or cash. Payment plans are also available. Full shares are $600 with an option to break it into 3 payments of $200. Half shares are $350with an option to break it into $150 (1) and $100 (2). Should another plan be needed, please feel free to call or email. From the beginning we have always believed that a CSA was the driving force behind our success as a small organic farm. For 20 weeks we provide weekly and bi-weekly pick-ups and drop-offs for our clients comprised of what we have growing in the fields that particular week. We have pick-ups at farmers markets (New Haven, Sandy Hook, Washington Depot), and we also have drop spots (in Fairfield & New Haven Counties, and Brooklyn NY). Stay tuned for locations. We have pick-ups at our barn store on East Street in Washington (entrance opposite #41 East Street driveway). Finally, we have special corporate rates/opportunities for companies and groups who want to provide employees with access to CSAs to be delivered to their work. Email us with any questions you have - info@waldingfieldfarm.com. As most people who join CSA's know, the money we take in helps the farm operate all season long, even when there is no produce to be harvested. It pays for our seed purchases in the winter months, labor & start up costs in the spring, and most importantly it allows the farmers to focus on growing instead of "marketing" the harvest. Most importantly, it is is your commitment to sharing the risk in what we do, and the reward is some of the best organic food in CT. So think about it. Does this work for you and your family? We understand in today's society that many people wish to participate in the local food system and that joining a CSA is a great way to ensure that farms stay in your area. Thanks! Get to visit the farm at least once a season (if not a farm pick up), great for kids! Hope to have you all on board!